Although there will always be some who will not see, without a doubt, a great many Catholics recognize there is something seriously (even diabolically) amiss in the post-vatican II church! But what is it, and what do we do about it? How has this happened? Well, as many folks are aware, the devil wants to be worshipped as God - "I will ascend above the height of the clouds, I will be like the most High"(Is.14:14). He therefore apes(imitates) God, he "transformeth himself into an angel of light"(2 Cor. 11:14). Hence, the term 'spirit of the anti-Christ' - because he imitates the Holy Spirit of Christ! as he does in his false religions, including the modern catholic ecumenical religion, and especially in the charismatic movement. Incredible as this may sound, we can infallibly substantiate this claim with this irrefutable fact: 'the Truth - can not possibly contradict the Truth! "I am the Lord, and I change not."(Mal. 3:6). What the Holy Spirit of Truth has constantly taught through His One, Holy, Catholic,and Apostolic Church for twenty centuries, is being contradicted by the 'spirit’ of the charismatic's and the ‘spirit' of vatican II, mainly (but not only) by the promotion of false ecumenism (religious indifference) - which is an attack on the Truth, and highly destructive of souls, as they lose the true Faith which our Lord teaches is necessary for salvation! "He who does not believe (the True Gospel) will be condemned"(Mk.16:16). Now, evidently, few there are indeed who are aware that satan's imitation of God actually extends to his having his own 'universal' church and hierarchy! And the 'mother-house' of evil from which has proceeded all the serpent's vicious attacks against Christ and His True Church is Freemasonry - also called 'Judeo-masonry' since they derive their evil doctrine from the anti-Christ's Jewish 'Kabbala' (JP II hasn't got around to kissing that one yet!). Their deceptive slogan is 'universal brotherhood', but to the exclusion of God, His Authority and Saving Truth! Their goal: 'man as God '- which is the religion of the anti-Christ. Pope Leo XIII in his letter Delalto Apostalico Sagio 1890 stated: "The masonic sects are already judged. They are possessed by the spirit of satan, whose instrument they are. They burn like him with a deadly and implacable hatred of Jesus Christ and His work, and they endeavor by every means to overthrow and fetter it." Freemasonry has been strongly and officially condemned by every Pope from Clement XII in 1738 to Pius XII in 1950 (over 200 years!) - but not since. - I repeat not since! Nor has communism (the freemason's 'strongarm' tool) been condemned since! Consider, if you will, the undeniable reality this fact demonstrates. "Whose coming (the anti-Christ's) is according to the working of satan, in all power, and signs, and lying wonders, and in all seduction of iniquity to them that perish; because they receive not the love of the truth, that they might be saved. Therefore God shall send them the operation of error, to believe lying: that all may be judged who have not believed the (True Catholic) truth, but have consented to iniquity (2 Thes.2:9-11). POPE CLEMENT XII (1738) - 'In Eminenti' : "We have resolved and decreed to condemn and forbid such Societies, assemblies, reunions, conventions, aggregations or meetings called either Freemasonic or known under some other denomination. WE CONDEMN AND FORBID THEM BY THIS, OUR PRESENT CONSTITUTION, WHICH IS TO BE CONSIDERED VALID FOREVER." POPE PlUS VI (1775) - 'Inscrutibile': Warned of these 'SECTS OF PERDITION (HELL)' , who were penetrating everywhere, even into the Church! POPE PIUS VIII: in his encyclical 'Traditi', 1829: showed that all Masonic Sects issued from the "WELL OF PERDITION", and following Leo XII, most particularly mentions the Sect called "Universitaire", saying: "IT'S AIM IS TO CORRUPT YOUTH IN SCHOOLS." POPE GREGORY XVI (1832): Encyclical "Mirari Vos": "EVIL comes out of Secret Societies, bottomless abyss of misery, which those conspiring societies have dug and in which heresies and sects have, as may be said, vomited as in a privy all they hold of licentiousness, sacrilege and blasphemy." POPE PlUS IX (1873): "The Satanic spirit of the Sect was particularly evidenced, in the past century, during the course of the Revolutions of France which shook the entire world. Such upheavals proved that the total dissolution of human society could be expected unless the forces of this ultra criminal Sect were crushed." - "However, the Apostolic See's efforts have not been crowned with the success that might have been expected. The Masonic Sect of which we speak has been neither defeated nor overthrown: JUST THE REVERSE, the Sect has developed to such an extent that, in these days of great difficulty, it shows itself everywhere and with impunity and raises a more audacious countenance." POPE LEO XIII (1884): Encyclical "Humanum Genus" He labels Freemasonry the "SYNYGOGUE OF SATAN", and reveals the triple Masonic character as being (1) Counter-Morality (2) Counter-State (3) Counter-Church "It is now publicly and overtly that they undertake to ruin the Holy Church, so as to succeed if it is possible, in the complete dispossession of Christian nations of all the gifts they owe to Our Savior Jesus Christ. As a result, in the space of a century and a half, the sect of the Freemasons has made incredible progress. Making use at the same time of audacity and cunning, Masonry has invaded all the ranks of social hierarchy, and in the modern States it has begun to seize a power which is almost equivalent to Sovereignty." He saw that Masonry occupied the place of "State within a State", and would soon form the Super State, from which situation they issue their 'dogma' of separation of Church and State. He said Masons maintained that all means were to be systematically used, in order to saturate the multitudes with licentiousness and vices; because in their opinion peoples would naturally fall into their hands and become (their) instruments. Their counter-morality includes "civil marriage, divorce, free 'love', and the irreligious education of youth." POPE SAINT PIUS X:( 1907 ) Condemned separation of Church and State as “a most pernicious ERROR." He said the mason's "declarations, a thousand times published and republished... are proof in themselves that attacks against the Church have been led progressively and systematically." He said "They want to extirpate from your hearts the FAITH... and it is this (One,True) FAITH WHICH MUST BE DEFENDED... the FAITH which covered your ancestors with glory." * On July 14,1889 Albert Pike issued formal written instruction to the 23 'Supreme (masonic) Councils' of the world. He said: "To you sovereign grand inspectors general we say this, that you may repeat it to the brethren of the 32nd, 31st, & 30th degrees. The masonic religion should by all of us initiates be maintained in the purity of the Luciferian doctrine. Yes, Lucifer is God, and the true and pure religion is the belief in Lucifer." On page 324, he identifies Lucifer as the devil: "A devil, the fallen Lucifer..."
* The occult-based 'New Age' (short for 'New World Order') movement is fully masonic in origin. They published the 'NEW AGE' magazine (now called 'Scottish Rite Journal') for 100 years. Prominent new-ager David Spangler said: "The light comes from Lucifer, he is the light-bearer." * "It is evident that there are only Jews and kabbalistic Jews in Masonry's origin." (Bernard Lessare - Jewish historian - M.H.F.M. video). * Both the MAFIA and the 'P-2' Masons of Italy, were founded by Giuseppi Mazzini, who said: "Our final end is that of Voltaire and the French Revolution - the destruction forever of Catholicism." * A mason,'F. Limousine', in the magazine "Masonic Review" - Oct. 1902: "Freemasonry is an association... an institution, so it is said. But it is not that at all. Let us lift up all the veils, risking even to evoke numberless protestations - FREEMASONRY IS A CHURCH: It is the COUNTER-CHURCH, COUNTER-CATHOLICISM. It is the OTHER CHURCH - the church of Heresy, of FREETHOUGHT." * In the Freemason's book "The Evolution of Freemasonry", by Delmar Darrah - page 89 it states: "MARTIN LUTHER opened the way for the future development of Freemasonry." * Mason 'Manly P. Hall', in his book "The Lost Keys of Freemasonry", page 48: "When the mason learns the key is the proper application of the dynamo's living power, he has learned the mystery of his craft - the seething energies of Lucifer are in his hands." Who but the serpent - could contrive such cruel and sinister subversion! (The masons refer to Lucifer as 'the Great Architect of the Universe')! * "Catholics...must not forget that all roads lead to God. (!) And they will have to accept that this courageous idea of freethinking, which we can really call a revolution, pouring forth from our Masonic lodges, has spread magnificently over the dome of St.Peter's." (Yves Marsaudon, book 'Ecumenism Viewed by a Traditional Freemason') He also wrote: "ONE CAN SAY THAT ECUMENISM IS THE LEGITIMATE SON OF FREEMASONRY ..Catholics, Orthodox, Protestants, Israelites, Moslems, Hindus, Budhists, freethinkers, freebelievers; to us these are only our first names, 'Freemasonry' is our family name."! Well... does that not make obvious what John Paul II's 'pan-religious' Assisi Meetings are about? He is 'dissolving' the True Faith before the entire world! At this point, is it not clear too, that therein lies the essence of satan's attack against God's Church - 'Religious Indifference / False Ecumenism! ' For to drag down the One True Faith, the only road to heaven, pointed out for us by our AII-Good, AII-Wise God.. to a par with all the false man-made religions, roads to hell, would be to negate and destroy it. And the evil plot is carried out with the delusion of 'Brotherly Love', while obscuring the First and Greatest Commandment to "LOVE THE LORD YOUR GOD WITH YOUR WHOLE HEART, AND MIND, AND SOUL, AND STRENGTH." Mr. John McManus of the 'John Birch Society' (good guys! ), on his audio entitled "The threat of One World Government - New World Order" relates that in 1978 a magazine in Italy entitled 'Le Grande Lodgio Vaticana' (the Grand Lodge of the Vatican)! listed the names, and dates of entry into freemasonry, of '120' prelates of the Catholic Church! 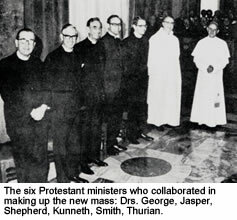 One of them: 'Arch-Bishop' Annibali Bugnini, who with the help of six protestants, and with Paul VI's 'blessing', concocted the new mass sacrilege. Another was 'Cardinal' Joseph Suenens of Belgium, reportedly one of the most active destroyers of True Doctrine at Vatican II. He rejoiced: "Vatican II was the French Revolution in the Church!" Suenens was the servant of satan who, also with Paul VI’s ‘blessing', launched the ultra-ecumenical charismatic movement... Oh, the destructive power of giving poor abandoned catholics a 'direct line' to an ecumenical 'God', who 'trickle charges' them with pride! It is not a coincidence that the Masons called their mutilated and protestantized sacrilege the 'Novus Ordo Missae' (NEW ORDER of the Mass). It was to be, and is, the instrument by which they would gradually destroy the True Faith in multi-millions of Catholics world-wide, and through an ongoing process of protestantizing and 'ecumenizing', actually bring them to think like masons! For even though the whole Catholic Gospel of Christ RINGS with the saving principle: "BETTER TO BE DIVIDED BY TRUTH, THAN UNITED IN ERROR", the goal of Lucifer's church is (consistent with his lie 'You shall be like God'), to build on the ruins of Christendom a 'stew' of all religions and cultures, a NEW ORDER, a NEW AGE, where Christ and His One True Religion are excluded, and Man is all in all (i.e. John Paul II's "Civilization of Love"). In the Mason's magazine 'New Age', Sept. 1950, freemason C.W. 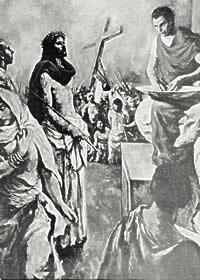 Smith wrote: "God's plan [read Lucifer's plan] is dedicated to the unification of all races, religions and creeds. This plan, dedicated to the New Order of things, is to make all things new --- a new nation, a new race, a new civilization and a new religion, a non-sectarian religion that has already been recognized and called the religion of "The Great Light". * John XXIII in opening Vatican II: "The prophets of doom always talk as though the present in comparison to the past is becoming worse and worse. But I see mankind as entering upon a NEW ORDER, and perceive in this a Divine plan." * Paul VI told the U.N. assembly in New York, Mar. 6, '67: "Your vocation is to bring not just some people, but all people together as brothers. [ ! ] Who can fail to see the need and importance of thus gradually coming to the establishment of a 'world authority' capable of taking effective action on the juridical and political plane. Delegates to international organization, public officials, gentlemen of the press, teachers and educators, all of you, must realize that you have your part to play in the construction of a NEW WORLD ORDER." These quotes of the anti-popes are merely a drop in the bucket to what could be shown of their despicable words and actions which blatantly oppose 20 centuries of unchangeable Divinely Revealed Catholic Truth. 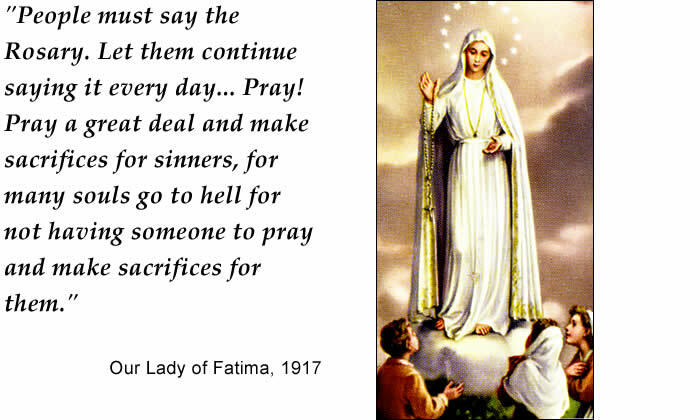 It is our hope and prayer that everyone who reads this material, will hurry back to the Ark of Salvation: study and embrace the Traditional Catholic Faith, attend only the True Catholic Mass (when you can - Sunday obligation obviously does not apply to the Mason's 'mass'), pray the Rosary every day, and have a true devotion to our Blessed Mother. Rome, the 'great city' (Apoc.17:18) has become, as our Lady predicted at La Salette - "the seat of the anti-Christ" - the great harlot (Apoc.17:1), the mother of the fornications and the abominations of the earth (Apoc.17:5). God's instruction for all those who yet remain in the modern catholic harlot church, has rested in Scripture for 20 centuries (Apoc.18:4): "Go out from her my people; that you be not partakers of her sins, and that you receive not of her plagues." It has been this writer's experience that, only when you 'go out from her', only when you break off all communion with the anti-church and the anti-pope at her head - will the smoke of satan lift, and will you be able to fathom the depth of her ugliness! Only then, will you make the necessary repentance for having taken part in her abominations, and for every penny with which you helped her to oppose Christ, and His ineffable Doctrine. "They should consider the testimony of Christ himself, that those who are not with Christ, are against him. And they disperse unhappily, who do not gather with him. 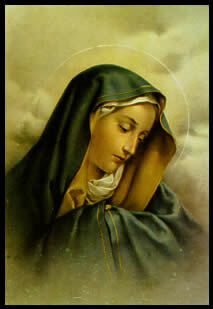 Therefore they will perish forever unless they hold the Catholic Faith whole and inviolate." Part II : "Who is the Anti-Christ?"